Stud Poker is a 5 card, ‘no-draw’ poker game. 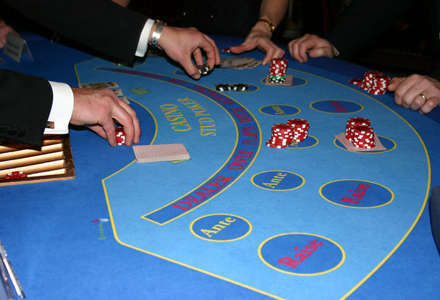 The game begins by the players placing a bet on the ‘Ante’ box. The dealer then shuffles one full pack of cards and deals five cards to each player face down and five to himself, with the last card dealt face up. 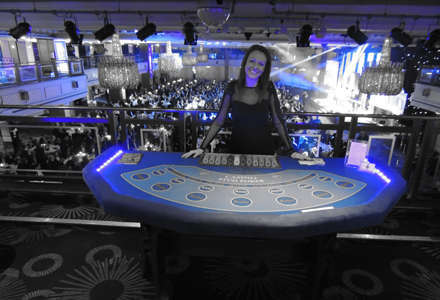 The players then pick up their cards and decide whether they think that their hand can beat the dealers. (The player has only to beat the dealer, it doesn’t matter what cards other players have). If the player decides that he can beat the dealer, he places an additional ‘Raise’ bet behind his ante, which needs to be exactly double his ante. If the player decides that the dealers hand will beat his own, then he can fold and forfeit the ante bet. Had the wonderful photo mirror at my wedding! It looked amazing and my guests loved it! Would 100% recommend them to anyone!! We recently booked Diamond Fun Casino as entertainment for our wedding. Aside from offering a very reasonably priced package, they set-up discreetly and were very engaging with our guests which complimented the positive atmosphere already at the event. Thanks again guys. I worked with Liz and Murat at Diamond for our company's biggest awards ceremony, the World Procurement Awards 2018 on May 17. They were a real pleasure to work with, both pre- and during the event. Very responsive, accommodating and professional. They didn't just supply what we requested, they went beyond that and were helpful onsite, too, delivering an outstanding experience to our guests. We worked with them in the past and we will definitely work with them again! I am the Events Manager at The Compasses at Pattiswick. I am very late in writing this review (apologies), but wanted to express what a wonderful and professional service we received when using Diamond Fun Casino for a Christmas Party last year. From booking, right through to the night everything ran smoothly. The tables look great and add that little something extra to any party night! Diamond Fun Casino supplied one of their Photo Booths for our Wedding Reception in November.Liz was fantastic right from the day we booked with them, and also came along to attend the booth on the day. They replied to emails and phone calls very quickly and were professional and friendly. All of our guests loved the booth, and we were so pleased we booked it as it ended up to be very popular throughout he evening! Liz offered us their guest book for £50, which meant we got a copy of everyone’s photos in a photo book with a written message from guests, which we were so pleased we chose once we saw it! We also got a USB stick with all of the photos.This is a very professional, friendly, experienced company with great staff. We would highly recommend them! © Diamond Fun Casino Limited. All Rights Reserved.